SNMP defines both how to structure management information (data model exposed for management), and how to access it (protocol). According to SNMP, the management information is structured into MIBs (Management Information Bases). A MIB is defined using a formal language called Structure of Management Information (SMI) – whose syntax uses a subset of ASN.1 (Abstract Syntax Notation 1). When dealing with remote devices, there should be some standard to understand the information stored in the SNMP agent. SNMP accomplishes that through MIB. The basic verbs of the SNMP protocol are GET, SET, and GETNEXT (SNMPv2 adds GETBULK). An SNMP entity can also send asynchronous events (a TRAP in SNMPv1, a NOTIFICATION or an INFORM in SNMPv2). What you GET and SET are individual variables of simple types (to simplify, strings/integers/enumerations) which can be either scalar – or located in tables. OBJECT-IDENTIFIERS are at the root of the Structure of Management Information (SMI) used to describe SNMP data. To make it brief, an OBJECT-IDENTIFIER or OID identifies a node in a global tree whose arcs (segments between parent and child nodes) are identified by numbers. 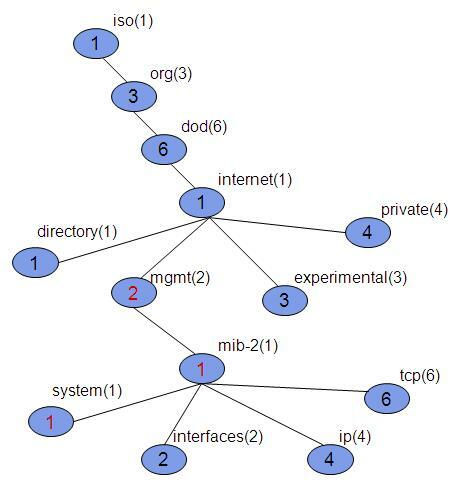 All SNMP definitions – MIBs, objects, etc… are identified by their OID in this global tree. The root of the OID tree is defined by the ASN.1 standard, and has three nodes at its first level iso, ccitt and joint-iso-ccitt. In next article, we will see the terminologies used in SNMP. I am a final year engg student and i am working on a developing a network mapping device which lists out all the devices in a network. Each device should be identified as to what it is. Like a switch, system, bridge etc. I am completely lost and unable to figure out a way which could do the same. Any guidance will be mighty helpful.